In April this past year I first wrote about the perforated or punched scroll-board on the Egerton tall clock (read about here). Since then I’ve been working on the details, trying to get patterns complete and finally decide how I plan to go about the work. This weekend I began experimenting with a couple of different materials to see if one would be better than the other – I have yet to decide if this is the actual process I plan to use to punch my scroll. The first material was a scrap of the backed veneer I used for the clock’s door and base front (click here if you want to take another look). I placed half of a paper pattern of the scroll onto my scrap and went to work. 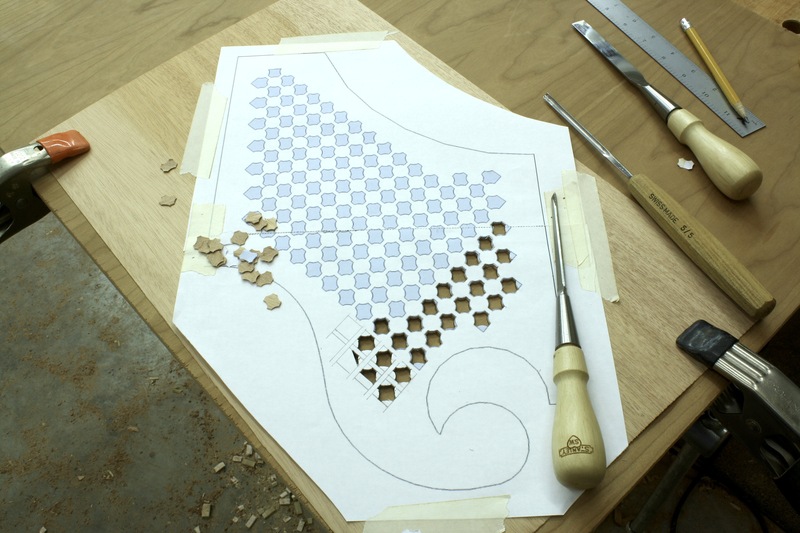 Each small cutout requires eight stabs, four using a carving gouge and four with my 1/8″ chisel. In the backed veneer, I needed a bit of force to push through. 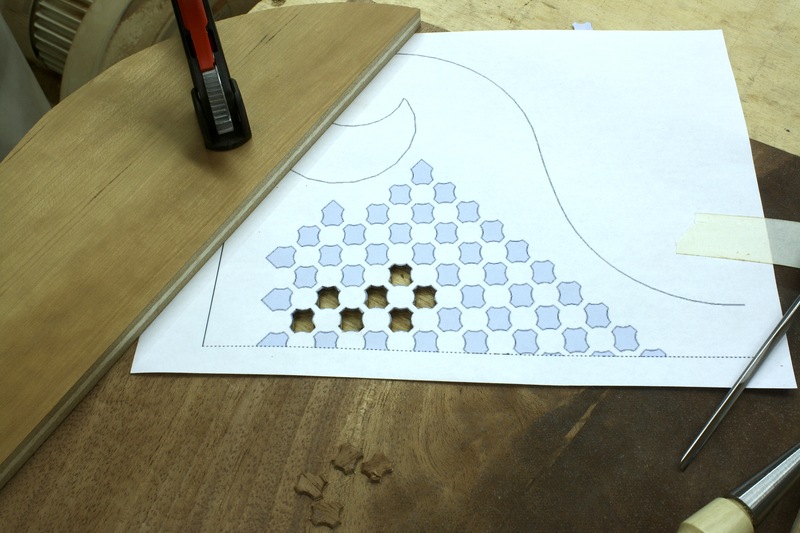 After a number of holes were punched, I took a look at the cutout area and decided this would work. The problem I have withthis material is that the veneer is crotch mahogany. Being crotch, the grain pattern is somewhat wrong for the scroll-board. In the original, the grain pattern is more straight, and it runs at an angle that directs your eye toward the top of the clock – one of the woodworking rules to which I like to adhere. 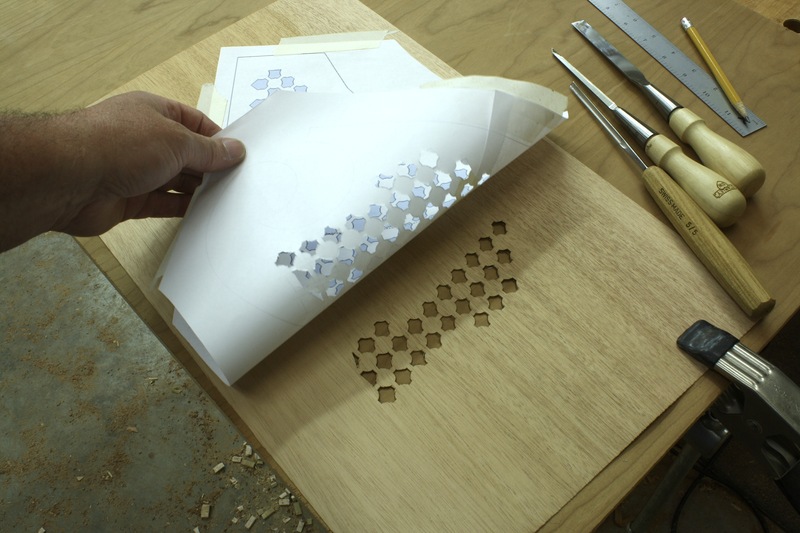 In order to use a piece of straighter-grained veneer, I had to turn to a paper-back veneer. First I had to see if it works; my primary concern is that the veneer, along the thin connector lines between the cutouts, splits and cracks. My second concern is using a paper-back veneer. I cut a piece of of material, laid the paper pattern on top and again went to work. After working for about 30 minutes – yes, the work went quicker than I expected due to the material being thinner and because I developed a better routine – I peeled off the tape to take a look. You can see the results below. I like the look and either material seems to work out, but I think I’ll pass on the paper-back veneer. This week I’ll make some pieces of shop-cut veneer just so I can get the grain right. 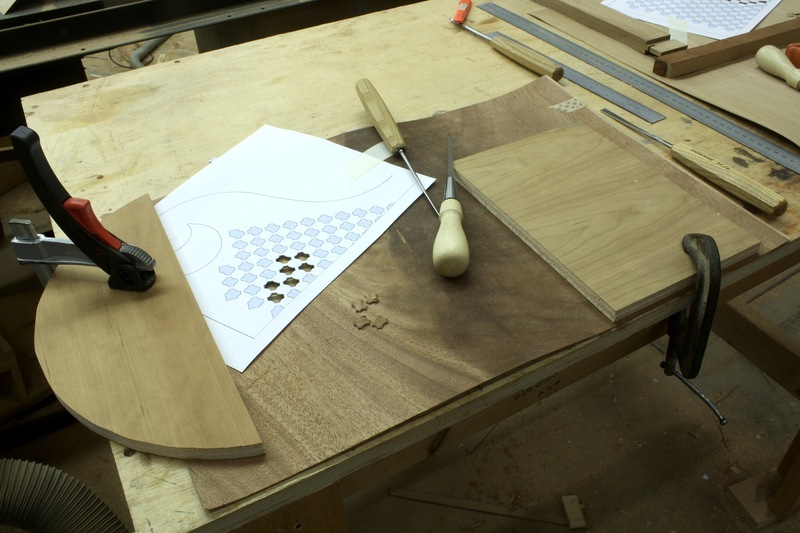 And to provide support for those small connectors, I’ll add a cross-grain backer. I expect that the work will be more difficult due to the thicker veneer, but I’ll stay more true to the original and the look should be right-on. Scroll pediments are the front panels found at the top of some of the most impressive pieces built in the 18th- and early 19th-centuries. Furniture such as Bonnet-top high chests of drawer or highboys (as shown in the left-hand photo), bonnet-top chest on chests and many period clocks have scroll pediments. It’s on these panels that gooseneck mouldings are applied. 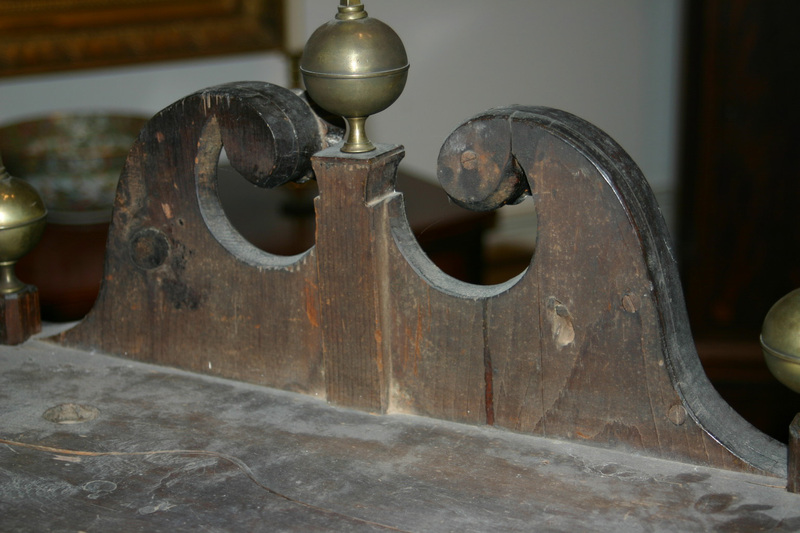 Scroll pediments, at least on the highboys and other chests that I have seen in books and museums, have the grain running from side to side. (Most scroll pediments attach to the pediment returns with dovetails.) The same holds true for many clocks. But that is not always the case. 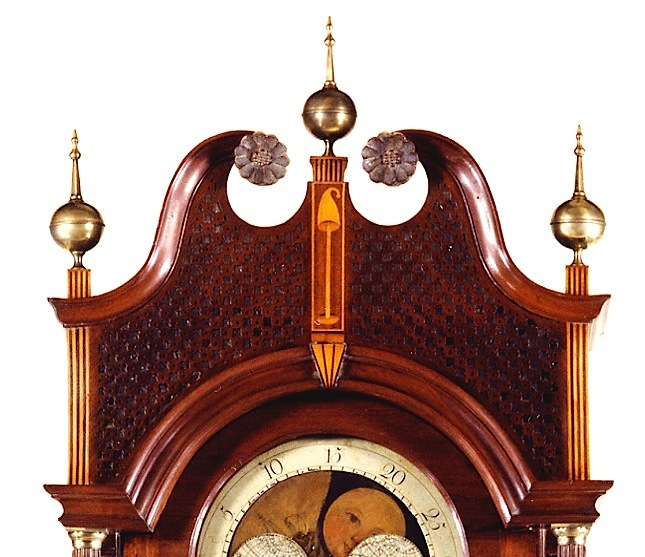 Tall case clocks are different when it comes to how they were built in the late 1700s and early 1800s. On tall case clocks, you can find many construction techniques that leave a 21st-century woodworker scratching heads. Some period clocks – some very expensive period clocks – appear to be held together with little more than chewing gum and grime collected throughout the years. I have pointed out a few of the let’s say questionable construction techniques I’ve found on the Egerton clock that I’m working on. The scroll pediment is just another example. On the original clock, which at one time was for sale at $120,000, the grain of the pediment runs vertically. I know this because I have a photo of the back of the hood. As I work on my tall clock, I am changing many of the oddities I found with the original, but as always the case, a few of those questionable construction techniques are being repeated. Case in point is the scroll pediment. I decided to keep the grain direction vertical. How this changes the building of my clock is most apparent as you work on the pediment returns. 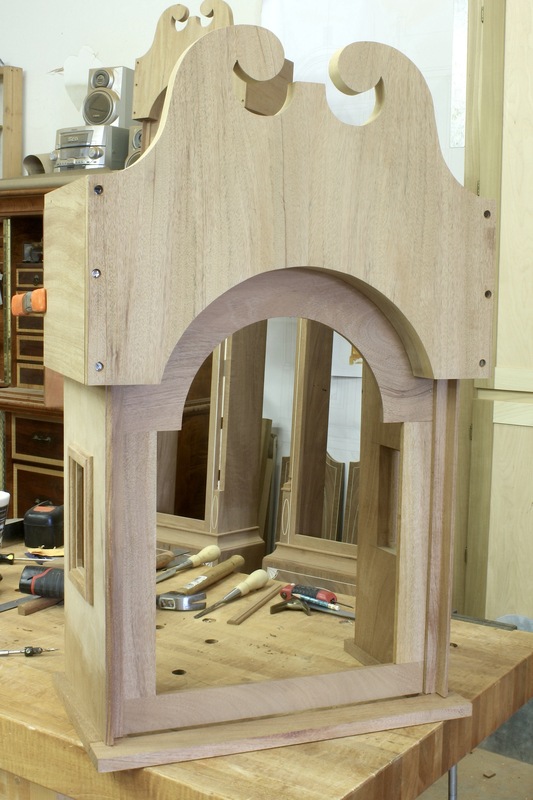 Dovetails, which are found on many of the period clocks that have broken-arch pediments, are not an option because the grain on the returns runs perpendicular to the scroll pediment. As a result, I attached the pediment and the returns with screws. I expect that nails were used on the original, but I went with screws (tightly fitted at the bottom and in over-sized holes at the middle and top for seasonal movement) for a more secure hold.